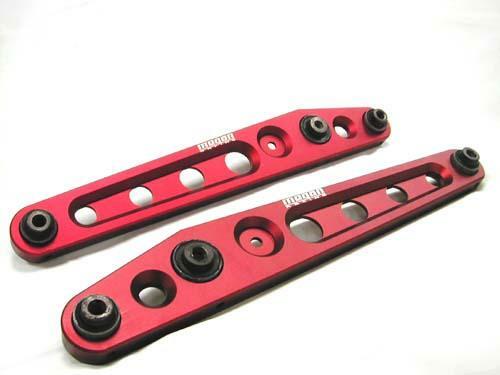 Megan Racing Lower Control Arms (LCAs) are an essential part to your car s suspension. When lowering your car your wheels will start to butterfly inward at the top which makes your tires ride on the edge. This increases wear on your tires as the sidewalls are the weakest part of your tire. This also means that there is less tire on the ground which means loss of traction around turns. Megan Racing LCA s reduce camber so that more of your tire touches the ground, keep your tires from rubbing your fender and allow for a wider wheel and tire combination. These Megan Racing LCA s provide light-weight performance with an enhanced appearance to your suspension. These arms are available in Red and Blue finish.